Half the world’s webpages are in English, but less than 15 percent of the global population speaks it as a primary or secondary language. It’s no surprise that Chrome’s built-in Translate functionality is one of the most beloved Chrome features. 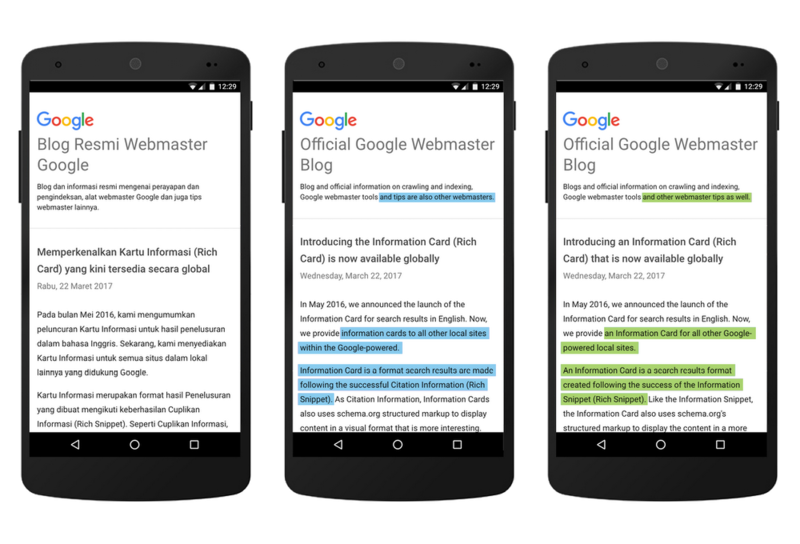 Every day Chrome users translate more than 150 million webpages with just one click or tap. Last year, Google Translate introduced neural machine translation, which uses deep neural networks to translate entire sentences, rather than just phrases, to figure out the most relevant translation. Since then we’ve been gradually making these improvements available for Chrome’s built-in translation for select language pairs. The result is higher-quality, full-page translations that are more accurate and easier to read. Today, neural machine translation improvement is coming to Translate in Chrome for nine more language pairs. Neural machine translation will be used for most pages to and from English for Indonesian and eight Indian languages: Bengali, Gujarati, Kannada, Malayalam, Marathi, Punjabi, Tamil and Telugu. This means higher quality translations on pages containing everything from song lyrics to news articles to cricket discussions. From left: A webpage in Indonesian; the page translated into English without neural machine translation; the page translated into English with neural machine translation. As you can see, the translations after neural machine translation are more fluid and natural. We’ll bring neural machine translation to even more languages in the future. Until then, learn more about enabling Translate in Chrome in our help center.